This Thursday-level puzzle was released in mid-February 2013 at a very busy time for all four of us, but some news just begs for memorialization in crossword form. Click here to view or download the puzzle in PDF format; here to download it as a puz file; here to download it as an ipuz file [requires the free Puzzazz app to solve]; here to solve the puzzle interactively (thanks to Jim Horne); here for the solution. We thank Marcia Brott, Brent Hartzell, Martin Herbach, and Tom Pepper for astute beta testing. 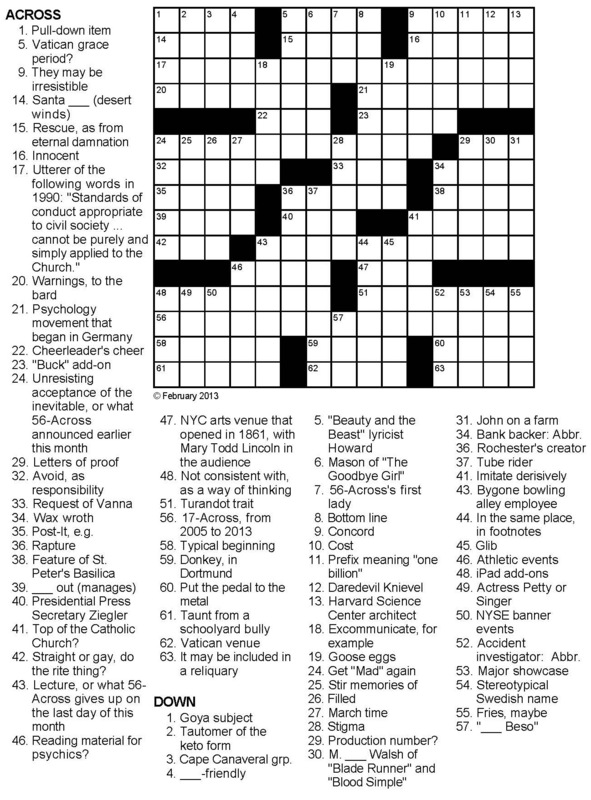 While proof-reading our puzzle, we became aware (spoiler) of an earlier appearance of 56-Across in a crossword puzzle, one written by Judge Victor Fleming for the May 4, 2005 New York Times. Click here to view that puzzle, and here for its solution. More puzzles here (all), here (tributes), and here (current events).